Bonnie and Clyde are possibly the most famous criminals in American history, so a movie about their bloody death probably ought to be gritty, salacious western. Instead, we've got The Highwaymen, which plays out like a dull cross between a buddy cop movie and a underdog sports romp. The story doesn't follow Bonnie and Clyde, but rather the two Texas Rangers that caught them. 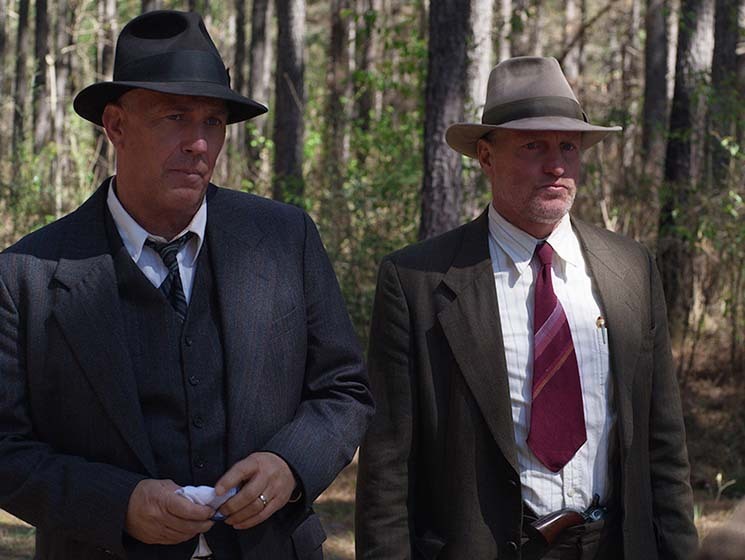 Frank Hamer (Kevin Costner) and Maney Gault (Woody Harrelson) are retired law enforcement officers, and they're called back to duty in 1934 to put an end to Bonnie and Clyde's spree of murders and robberies. Both of the officers are over the hill, and there are plenty of scenes illustrating that they're lousy shots who can't run and aren't very good at driving either. Woody's main character trait is that he goes pee a lot, while Kevin continually wipes his mouth with a handkerchief for reasons that are never explained. At one point he beats the crap out of a gas station attendant. They're meant to be hardscrabble Texas Rangers with dozens of kills under the belts, but neither Costner or Harrelson brings a shred of grit or emotion to these decidedly doofus-level characters. Only the always-brilliant Kathy Bates, in a too-brief role as Texas Governor Miriam "Ma" Ferguson, brings a magnetic presence to the screen. It's intriguing to see the limitations of 1930s investigative work, as the absence of technology means that our hapless heroes have no option but to follow a string of vague leads around the South. They're bringing a whole lot of firepower with them, thanks to a lengthy gun-shopping scene that will have NRA gun-nuts jumping for joy. It's a cat-and-mouse story — but in this scenario, the "cats" are bozos with a car full of automatic weapons. All it takes is a "good guy with a gun," right? The film also explores Bonnie and Clyde's peculiar status as folk celebrities, as they are revered as Robin Hood-style heroes amidst Depression-era poverty. We never actually meet the criminals, which adds to their enigma, but comes at the expense of the film exploring its two most interesting figures. And that, ultimately, is what's missing from The Highwaymen. It takes a famous story and attempts to elevate supporting players to the lead roles. But there's a reason why you probably haven't heard of Frank Hamer and Maney Gault before, and this lightweight film doesn't make much of a case for them having a story worth telling.